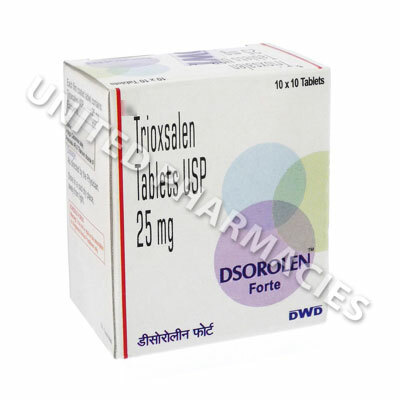 Dsorolen (Trioxsalen) is primarily used to treat certain skin conditions, including vitiligo and psoriasis. It is typically administered alongside a course of UV light therapy. Always use Dsorolen (Trioxsalen) as prescribed by your physician. Patients are normally prescribed between 20mg and 40 mg per dose, 2 or 3 times per week. Always leave a gap of at least 48 hours between doses unless you have been specifically instructed otherwise by your physician.